Édouard Debat-Ponsan (1847–1913), Nec mergitur, or Truth Leaving the Well (1898), media and dimensions not known, Hôtel de ville d’Amboise, Amboise, France. Wikimedia Commons. This week’s dip into the missing artists archive brings a painter whose fine academic finish mixed pastoral scenes with strong political messages, and whose grandson was an architect of modern France’s system of government: Édouard Debat-Ponsan (1847–1913). He was born in Toulouse, and trained under Alexandre Cabanel at the École des Beaux-Arts in Paris, at the same time that Jules Bastien-Lepage was training in that studio. Indeed, Cabanel seems to have taught the majority of the most successful and popular painters of the 1880s. Debat-Ponsan’s first well-known works were completed around 1870, but most now appear to have been lost. He served in the military during the Franco-Prussian War of 1870-71, and was a strong supporter of the Third Republic which succeeded it. As told in the Old Testament book of Judges, Jephthah swore an oath that, should he succeed against the Ammonites, the first object (possibly animate) to come out of the doors of his house to meet him, when he returned, he would deliver to the Lord as a burnt offering. Unfortunately, the first object to greet him was his only daughter. She pleaded for two months’ stay of execution, during which she went into the mountains to “weep for her virginity”, but on her return was sacrificed as Jephthah had sworn. 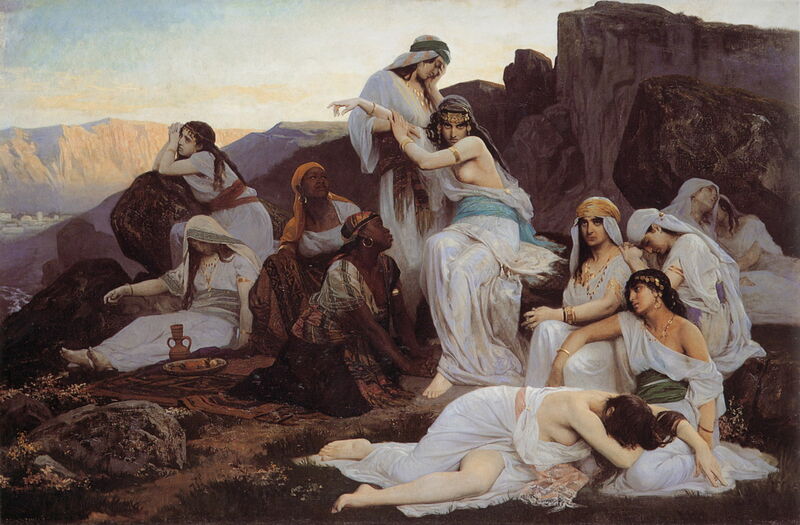 In The Daughter of Jephthah (1876), Debat-Ponsan breaks with tradition in his depiction of this story, and shows the daughter, with various friends and maids, during her stay in the mountains as she ‘wept for her virginity’. The daughter in question appears to be the woman at the centre, who is looking directly at the viewer with a sultry, almost angry, expression, as her entourage are doing most of the weeping. It is tempting to read this in the context of France’s crushing defeat in the Franco-Prussian War, and the defiance of the Third Republic in trying to make good the shortcomings of the state which it inherited. Otherwise it appears an odd treatment of the story. The following year, Debat-Ponsan was awarded money to travel to Italy, although he did not win the Prix de Rome, where he became inspired to paint portraits. 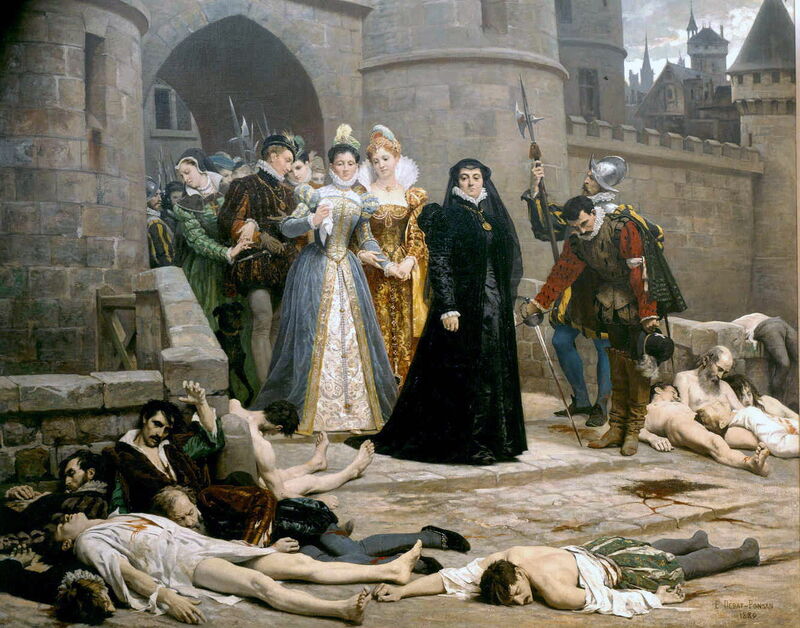 The next painting that I have found of his is another unusual narrative work: One Morning in Front of the Louvre Gate (1880), which shows Catherine de’ Medici (in black) gazing impassively at the bodies of French Protestants who had been slaughtered in the massacre of Saint Bartholomew in 1572. King Charles IX of France is said to have ordered this massacre, at least partly under the influence of Catherine, his mother, allegedly in fear of a (Protestant) Huguenot uprising. The reading of Debat-Ponsan’s painting has relied for its context on the massacre of communards in the Paris Commune, which followed the Franco-Prussian War. The expressions and gestures of her court are in stark contrast to those of Catherine de’ Medici. One fine detail worth noting is the blood staining the blade of the sword held by the man to the right of Catherine, and his obeisant bow. In 1882-83, Debat-Ponsan travelled with his brothers-in-law to Istanbul, where he became inspired to paint Orientalist works. The best-known of those is The Massage. Hammam Scene (1883), which shows a woman undergoing massage in a Turkish Hammam, or baths. 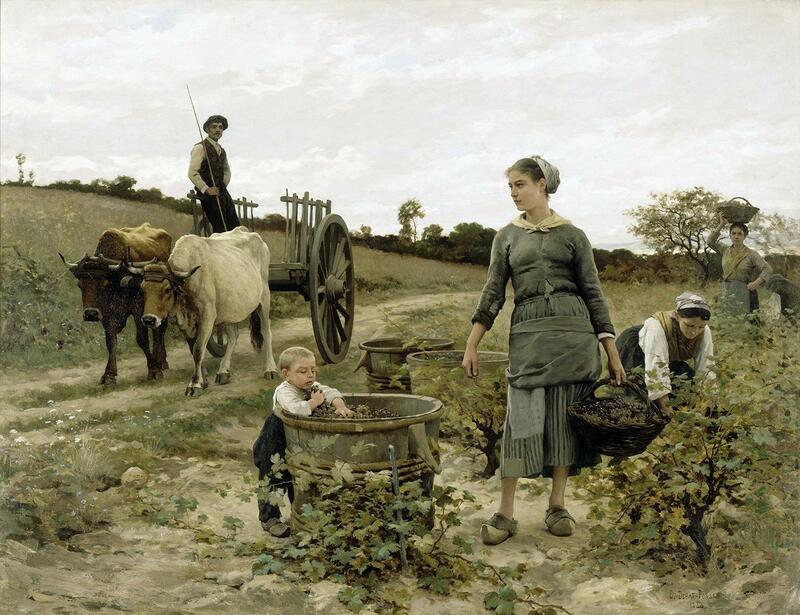 Édouard Debat-Ponsan (1847–1913), A Corner of the Vineyard (1886), oil on canvas, dimensions and location not known. Wikimedia Commons. In addition to his Orientalist paintings and portraits, Debat-Ponsan painted Naturalist scenes from the countryside, such as A Corner of the Vineyard from 1886. These appear to have been influenced by the success of Jules Bastien-Lepage, who had died only two years earlier. Although their clothing is patched, the farmworkers here are clean, well-nourished and wholesome, and he perhaps never fully embraced the Naturalist style. Édouard Debat-Ponsan (1847–1913), The Crown of Toulouse (1894), Salle des Illustres, Toulouse, France. Image by Pistolero, Wikimedia Commons. 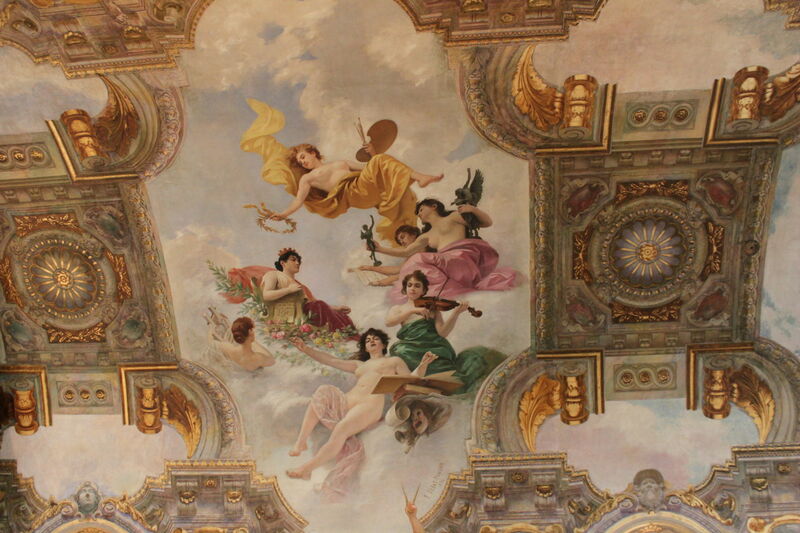 The grandest of Debat-Ponsan’s paintings which I have been able to find is his wonderful depiction of the Muses in The Crown of Toulouse (1894) in the Salle des Illustres (Room of the Illustrious) in Toulouse’s Capitol building. This is perhaps the height of ‘municipal art’ in the Third Republic. Édouard Debat-Ponsan (1847–1913), Gypsy at her Toilet (1896), further details not known. Wikimedia Commons. 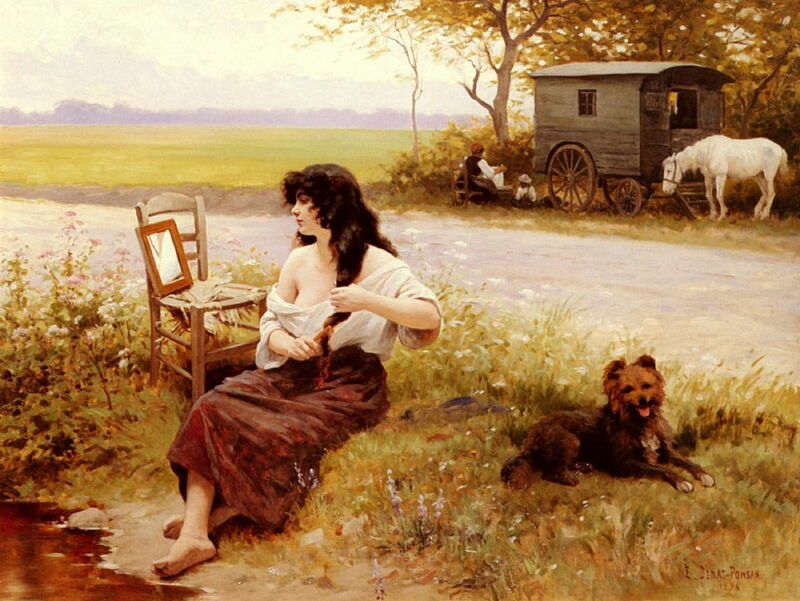 This unusual depiction of a Gypsy at her Toilet from 1896 is still idealised and idyllic, rather than showing the real-world squalor and dirt of life on the road. The gypsy’s caravan and white horse are almost theatrical. By this stage, Debat-Ponsan’s meticulous realist style was softening and becoming more painterly, as seen in the wayside flowers in the foreground. Politics returned to Debat-Ponsan’s art in his Nec mergitur, or Truth Leaving the Well of 1898. This is generally accepted as being his statement on the Dreyfus affair, which corroded politics in France between 1894 and 1906. Alfred Dreyfus was convicted of treason in December 1894, for passing French military secrets to the German Embassy in Paris, and was imprisoned in the notorious Devil’s Island penal colony in French Guiana. After a further investigation in 1896, which revealed another Army officer as the culprit, new evidence was suppressed, leading to the acquittal of that officer, and clumsy attempts to charge Dreyfus with additional crimes. France divided in its support for Dreyfus: Debat-Ponsan was firmly convinced of his innocence, and painted this work showing the naked Truth emerging from her mythological well and brandishing her mirror. Sadly, although a bold public statement, as a work of art it is too closely related to Gérôme’s painting of Truth, which was exhibited two years before. 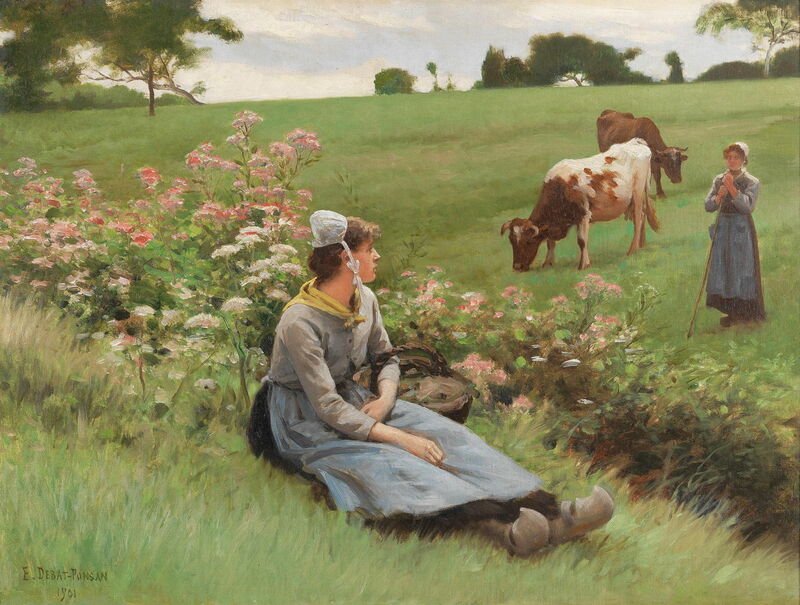 Édouard Debat-Ponsan (1847–1913), Rest in the Field (1901), oil on canvas, 49 x 65 cm, location not known. Wikimedia Commons. 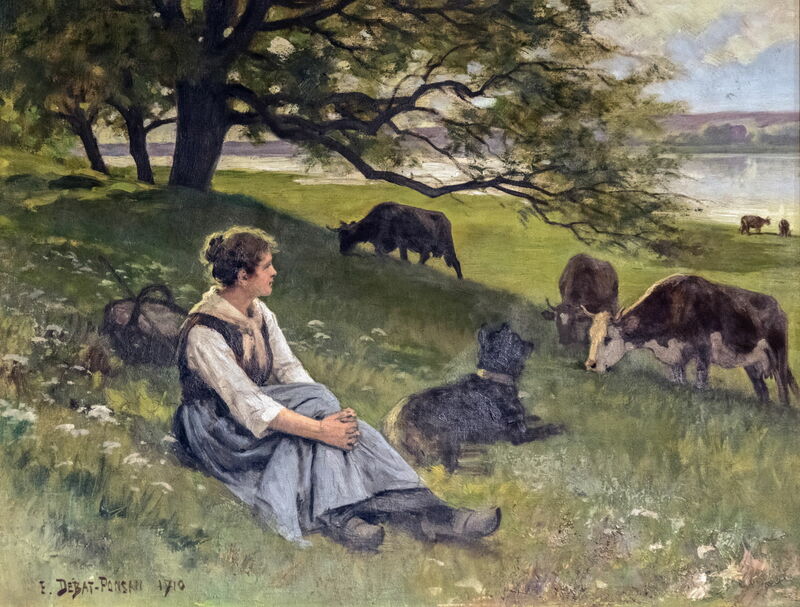 Most of Debat-Ponsan’s remaining paintings are pastoral scenes such as Rest in the Field (1901) above, and The Cowherd (1910) below, but they do show his increasingly painterly style. Édouard Debat-Ponsan (1847–1913), The Cowherd (1910), oil on canvas, dimensions not known, Musée du Vieux Toulouse, Toulouse, France. Image by Didier Descouens, via Wikimedia Commons. Édouard Debat-Ponsan seems to have continued to paint until his death in 1913. His son, Jacques, was already on his way to becoming a celebrated architect, winning the Prix de Rome (in Architecture) in 1912, and his grandson Michel Debré (1912-1996) became the first Prime Minister of France under the presidency of Charles de Gaulle, and one of those who drafted the constitution of the Fifth Republic, which continues today. Posted in General, Life, Painting and tagged Bastien-Lepage, Cabanel, Debat-Ponsan, Gérôme, narrative, naturalism, painting, realism. Bookmark the permalink.